Numancia ended 2018 with a valuable draw in the Alcorcón fog, in a game in which the Sorianos were a good match for their opponents at one of the toughest grounds in the league, once again cancelling out the hosts’ lead at a strategic moment. López Garai’s side played a good first half, and an even better second. With stout defending, applying pressure well and reaching the opponents’ area several times, the Rojillos once again had the disappointment of going behind in the dying seconds of the first half. Numancia went after the equaliser throughout the second 45, and after a good move started by Fran Villalba, Jordi Sánchez finished well to level the scores. Missing several first-choice players, López Garai had to make several changes, opting to put Escassi back into the centre of the defence, Kako as a holding midfielder and tasked Fran Villalba and Alain Oyarzun with creating play and connecting with the forward line. Ripa also returned at left-back and Marc Mateu moved further up the left wing. Up front, Guillermo was also back after several weeks out through injury. That was quite a few changes from the starting line-ups sent out in recent games, but it was a competitive eleven, just what was required to face a side like Alcorcón. The first half was a hard-fought affair. Playing away at Alcorcón always means rolling up your sleeves and getting stuck in, and it was no different this time round. With both teams pressing, neither were able to move the ball around fluidly, and it was end-to-end stuff. Numancia threatened Lizoain’s area early on, Alcorcón responded with a dangerous cross from the wing that Juan Muñoz could not quite get to. The first 45 was very even, but the hosts broke the deadlock at the very end from a corner. The ball was not cleared at the near post and reached David Fernández, who headed it into the net just as the clock hit minute 45. This was a shame, as the visitors did not deserve to go into the dressing room a goal behind. Numancia were therefore obliged to step up a gear in the second half if they were to find an equaliser. They had to keep up the momentum from the first half and find a way to improve in front of goal. Guillermo had an attempt with a stinging header following a good cross from Marc Mateu, but Raul Lizoain was equal to it and made a good save. Alcorcón were also on the look-out for a chance to increase their lead, and almost did when Carlos Gutiérrez had the misfortune to slip, letting Juan Muñoz through for a one-on-one with Juan Carlos, but the forward’s shot struck the post much to Numancia’s relief. That was the best chance the ‘Alfareros’ were to get, with the fog now thickening in the last game of 2018 in the Liga 1|2|3. Numancia’s efforts were rewarded with just 20 minutes to go. Fran Villalba won the ball in midfield and played a splendid pass through to Jordi Sánchez who finished with a fine shot. There was still time left to go for the win, and Numancia almost had it at the last when Borja Viguera, in a counterattacking move, dribbled past several opponents before shooting straight at a defender while Jordi Sánchez, completely unmarked a few metres away, was screaming for the ball. In the end, the points were shared in the fog, and what has been a historic 2018 came to a close. A.D. Alcorcón: Raul Lizoain, Laure (Borja Galán, m. 31), E. Burgos, Dorca, Nono (Toribio, m. 60), E. Silvestre, Juan Muñoz, C. Bellvis, Alvaro Peña (J. Pereira, m. 85), David Fernández, Sangalli. C.D. 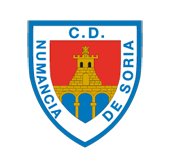 Numancia: Juan Carlos, Kako, Ripa (Viguera, m. 70), Escassi, Nacho (Jordi Sánchez, m. 64), Alain, Carlos Gutiérrez, Medina, Guillermo (Higinio, m. 85), Marc Mateu, Fran Villalba. Referee: Milla Alvéndiz (Andalusian Committee). Assisted by Martínez Moreno and Tejero García. Yellow cards for Bellvis and Borja Galán (Alcorcón) and Ripa and Higinio (Numancia).